The Austin Community College District visual identity/brand is rooted in community, value, trust, and academic excellence. Our logo creates instant brand identity. Any department, program, office, or division associated with the college should adhere to these ACC District logo use guidelines. It is against District policy to alter the ACC logo. ACC logos are federally registered trademarks and may not be altered or recreated. All departments and programs funded by ACC must use approved college logos. Logos associated with the ACC brand must be approved by the Office of Communications & Marketing. Individualized logos may not be developed without approval from the Provost/EVP of Academic Affairs and Vice President of Communications & Marketing. The Office of Communications & Marketing will work with programs to create individualized graphic identities that align with the official brand. The Austin Community College name, logo and trademarks, wordmarks, slogans, and other identifying symbols are the property of ACC and protected by federal and local laws. Any unauthorized use of these by any entity or individual without express written consent of the ACC District is a violation of the law. The logo is to be used on all correspondence, publications, signage, advertising, merchandise and other marketing and public relations materials. Please follow the ACC Logo Technical Requirements to confirm placement and that colors are used correctly. It should appear on the front page of all ACC publications, including brochures, course schedules, catalogs, etc. (The exception to this rule is official business of the Board of Trustees, graduation diplomas and transcripts, all of which will use the College seal) Use of the seal is limited to these areas. 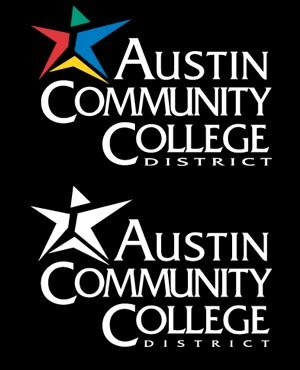 The Austin Community College and "ACC" name, logo and trademarks, wordmarks, slogans and other identifying symbols are the property of the Austin Community College District and are protected by federal and local copyright laws. Any unauthorized use of these or misleadingly similar names or marks, by any entity or individual without express written consent of the ACC District will be deemed a violation of the College's statutory and/or common law rights, and the College will take any and all steps necessary to protect such rights. Commercial use and reproduction without express written permission is strictly prohibited. This includes use by nonbusiness groups or individuals, employees, charities and other organizations. The use of any Austin Community College District name, logo or trademark on any product or in connection with a manufacturer, wholesaler, screen printer, in-store producer or any other supplier must be managed under a written agreement. Production or printing of any tangible item representing the College requires written permission through the Office of Communications & Marketing in ADVANCE. The use of any Austin Community College District name, logo or trademark on any product or in connection with a manufacturer, wholesaler, screen printer, in-store producer or any other supplier must be managed under a written agreement: other commercial use and reproduction without express written permission is strictly prohibited. Inquiries, requests and orders placed by individuals associated with the Austin Community College District do not imply permission to reproduce ACC’s name or images. Products produced without proper signature approval of the final design may be subject to non-payment or confiscation. The logo should be in its entirety The logo includes both the star emblem and the name of the college, in the typeface shown below, used in the specified colors. The two elements are inseparable and unalterable. No additional elements may be added. The star should never be used on its own; nor should the name of the college be shown in the typeface and configuration of the logo without the star. In addition it is not permissible to change the typeface of the logo or alter the proportion or composition of the logo in any way. There are 2 alternatives (horizontal and vertical) to use the logo for signage or merchandising. The alternatives of the logo include both the star emblem and the initial capitals in the college's name (ACC) in the typeface shown below. The two elements are inseparable and unalterable. No additional elements may be added. Use of these versions of the logo must be approved on a case-by-case basis by the Office of Communications & Marketing. The size of the logo can vary, but this must be done while maintaining the proportions between the logo's star and type elements. In any instance, the minimum size of the official logo can be no smaller than 3/4 of an inch by 1 3/16 inches (business card size), 3/4 of an inch by 5/8 inches (horizontal version) and 5/16 of an inch by 1 inch (vertical version). Web Sizes Use the logos found here. Use the logo in no smaller than the business card logo size (3/4" x 1-3/16"). The graphics inventory provides three sizes of the official logo in color and two sizes of the black and white version. Spacing When designing printed materials using the logo, consideration must be given to leaving ample blank space around the logo. This is for optimum recognition and readability. No other graphic or typography should be placed proportionally closer to the logo than the height of the initial capitals in the "A" or "C" of college's name. The blank space around the alternative logos should be the the height of the green triangle of the star. Placement on a page: As a graphic element, the logo should be part of the overall design of a page, to readily identify the College. As such, it should typically appear at the top or bottom of a page. 4" x 9" tri-fold: logo should be about 2-1/2" wide. 8-1/2" x 11" single sheet: logo should be no more than 3-1/2" wide. 11" x 17" poster: logo should be no more than 4" wide. Never use the ACC logo or elements of it as a background or watermark . Because printing presses, ink standards and other related processes vary, please notify the Public Information and College Marketing Department if you are planning to use the logo in its 4- color version. The Web colors for the logo are based on the RGB color scheme and hexadecimal numbers. Please notify the Public Information and College Relations Department if you are planning to use the logo in its 4- color version. In many instances, we can't afford color printing, or it isn't appropriate. Much of ACC's internal communications use the photocopier. In these instances, both the star and the type should be in solid black. A grayscale version of the color version is not permissible. In a two-color application, both the star and the type should be solid color. (i.e., black text and second, accent color) is BLACK. 2. The second color choice is Pantone Blue 280. 3. For all other color choices, contact the Public Information and College Relations Department. Against a solid, dark background (i.e, black or dark blue) the star should be in the official colors (following the PMS guidelines) and the type should be white.